This coming weekend is a very special one all throughout Canada. Thanksgiving Day arrives on Monday and, as a result, Canadians everywhere will be given a long weekend that will allow them to enjoy some special family time. Chances are that you have a big dinner planned, complete with turkey, cranberry sauce and pumpkin pie. But even if you don’t celebrate Thanksgiving in the traditional way, here’s hoping you’ll enjoy some time with loved ones. 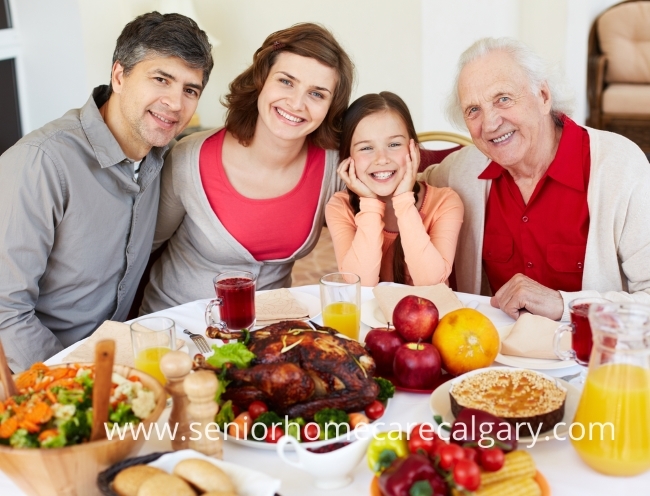 For many families across Canada, Thanksgiving dinner is shared in large groups. And many of those large groups include grandparents and great-grandparents. It’s important, of course, to be mindful of the needs of our elderly loved ones. Sometimes, it can be as simple as giving them spaces at the table that are closest to the nearest washroom. But there are a number of other ways to help your elderly loved ones enjoy a wonderful Thanksgiving. If your aging loved ones don’t live in the home where your upcoming Thanksgiving dinner is about to take place, be sure to make arrangements for their safe travel. For those who have mobility issues or use mobility solutions, arrange modes of transportation that can accommodate them comfortably. Keep the weather in mind as well. These frigid Alberta temperatures and unseasonal snowfalls, as of late, require all of us to dress warmly. Remember that seniors are often more sensitive and susceptible to the cold. Consider bringing a blanket to ensure their warmth during travel. It might not be such a bad idea to offer some dishes that are easy to chew and gentle on dentures. As well, if your aging loved one has particular issues with certain seasonings, be mindful to set aside a special plate where the food isn’t so spicy. Jenny Potter of Food Network Canada offers no less than 40 Great Canadian Thanksgiving Recipes that include “The Creamiest Mash Potatoes”, “Angel Biscuits” and “Slow Cooker Butternut Squash Cornbread” just to name a few. Thanksgiving dinners are often occasions when many stories are told and memories are shared. In fact, recalling fond memories is something that helps to strengthen families and rejuvenate the bonds that may have strained due to long distances and much time apart. Your aging loved ones will surely have a lot to contribute by way of sharing fond memories. One of the best ways to help an aging parent who is starting to experience symptoms of dementia is to reminisce about their experiences from long ago. Because dementia tends to impact short-term memory first, it’s considered best to discuss long-term memories. Taking trips down memory lane is often part of a traditional round-the-dinner-table discussion. But Thanksgiving celebrations are also usually filled with activities. Come up with particular activities that both your young and old family members can partake in. This can include group walks, board games, watching a movie or watching sports. On behalf of the entire team at Senior Homecare by Angels, have a Happy Thanksgiving everyone!